A chilling peek into the crumbling minds of deranged fish. Oh, what they will get up to! One climbs in the ol' barrel while the other splashes the cream in, and they both have the time of their lives! So great, so irresistibly delicious is their drive to die and be eaten, to become objects in someone else's life—exalted ingredients—that there is no limit to the degradation they will endure. 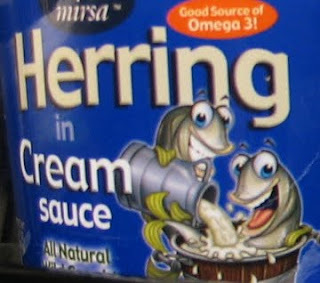 While we won't dispute the claim that this travesty might, in fact, be a "Good Source of Omega 3," we are dubious about the notion that this is "All Natural." Look in their eyes: what do you see in the scene they have created? They are around the bend, and whether their illness is chemical or emotional in origin, we find nothing natural about their behavior. It subverts every instinct, every drive and desire, of naturally occurring life.